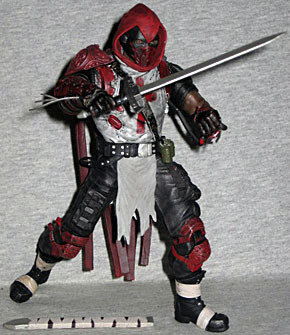 In DC's "New 52" reboot, Azrael seems to have been excised from continuity. But he lives on, thanks to Batman: Arkham City. Years ago, Michael Lane was part of a program to create the ultimate crime fighter. Instead, it turned him into an insane criminal. Thwarted by Batman, Michael confessed his sins to a priest of the secret religious sect, the Order of Purity. They recruited Michael to fight evil as their crusader Azrael, wearing the mystical Suit of Sorrows and wielding the Sword of Sin. If Michael does not keep his soul pure, the Suit of Sorrows will destroy him. It will? 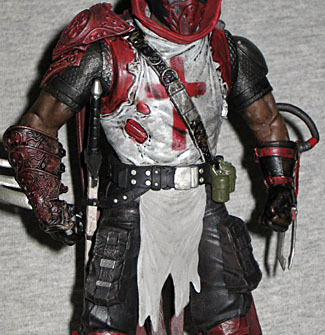 Azrael isn't really a character in Arkham City, just sort of an Easter egg/side quest. You chase him around town, he babbles some sort of religious hooey at you and that's it. It's still more of a cameo than a lot of characters got in Arkham Asylum, where seeing a newspaper clipping on a wall counted as an appearance by Firefly. This, meanwhile, is a full-body, in-person guest shot, which - in terms of this franchise - might as well mean the game is named after him. Since the Arkham games strive for something resembling a real-world aesthetic, Azrael is not just wearing a cloth mask over his face. It looks like a sturdier version of the protection you'd wear for paintball or motocross, but with more of a fitted mask over the rest of the face. The usual pattern seen on an Azrael mask is just hinted at here. The costume is clearly based on the recent Azrael costume, not the classic. It's a white tunic worn over body armor, but it's not as stylized as the comic version. He looks like he's been through a lot of battles, judging by the tatters his shirt is in, and he seems to be wearing it over improvised armor. 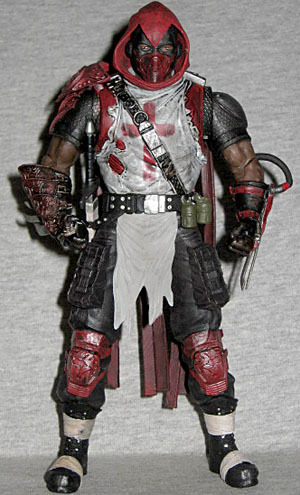 Gone are the perfect chainmail links, replaced by a red tactical vest worn over shortsleeved "honeycomb" armor. He has a large, ornate pauldron and gauntlet on his right arm, but that's the extent of his old-timey armor. His pants are modern, with thick pockets on the thighs. He's got plastic kneepads, and (for some reason) bandages wrapped around his boots. 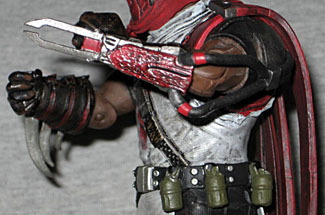 Most of Azrael's weapons are just sculpted on - for instance, the four grenades on his belt, or the weired blade thing on his left wrist. It's two hooked blades that point toward each other; judging by the two rubber hoses that run from under his shirt, down his arm, and into the glove, this may be some sort of flamethrower weapon. A fire-blade, perhaps? There are three large blades coming off the back of his right gauntlet, but two of them were severely warped by the tray while in the packaging. You may just want to get rid of them, because they're a pretty stupid design element. The only separate accessory is Azrael's sword. Well, his sword and his scabbard, but those kind of go together, you know? He can hold the sword in his right hand, and while there's a loop in the belt to hold the scabbard, there's nothing to keep it there. So if the sword isn't sheathed, the whole thing just falls straight through. Az's articulation isn't bad, but we'll tell you right now: no waist. He has a balljointed head, swivel/hinge shoulders, hinged elbows, swivel gloves, T-crotch, hinged knees and swivel boots. We could really use some biceps, because his arms are angled in toward the center, so when you bend the arms, his hands end up by his belt. Otherwise, it's exactly what we've come to expect from DC figures. On the plus side, the tubes on his left arm are flexible enough that the elbow isn't limited at all. It's surprising that Arkham City chose Michael Lane to be its Azrael, but then, they probably didn't know that DC was just about to (maybe) erase him from existence. His costume makes the jump from comicbook to videogame better than some others, and the toy itself is pretty good. I'm glad I picked this Azrael up.